akorIoT CB is world’s first NB-IoT adapter with the freedom to select other cellular radios out of the Cx range without a SIM lock. You can also select any MCU kit with an Arduino compatible R3 expansion slot. akorIoT is the world’s first IoT platform where virtually all options are open. akorIoT CX radio shields enable designers to easily develop and prototype cellular connected IoT devices using a 2G, 3G, 4G or 5G network. akorIoT includes all the components required to collect sensor data or sense position by GNSS as well as enabling data upload via a cellular network. It gives you the choice to select any cloud service you like for the management, storage and analytics of your IoT device. akorIoT also enables you to select any MCU evaluation kit with a R3 slot. The simplest MCU kit is the Arduino UNO. Real IoT products for mass production will use, for example, an ARM Cortex M0 up to ARM Cortex M4. The UN0 default configuration can be changed to e.g. STM32 Nucleo using jumpers. 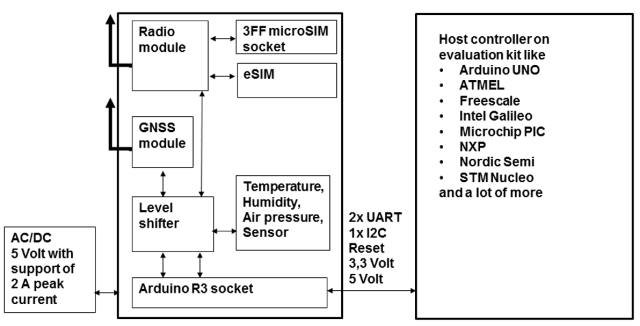 The cellular and GNSS module are connected to UART. The temperature, humidity and air pressure sensors are wired by I2C-Bus. Further sensors or extensions can be connected by the smart slot on rear of the radio shield. The MCU signal voltage level (3 to 5 Volt) is detected automatically. And akorIoT gives you the choice of MCU from, for example, ATMEL, NXP, Freescale, Microchip, Intel (Galileo), Nordic Semiconductor and a lot of more. The shield supports cellular and GNSS antennas through two SMA connectors. The default SIM card is an eSIM with automatic detecting and switching to the 3FF microSIM connector. Application development is supported by your local cellular provider or by akorIoT SIM. It is an eSIM or 3FF microSIM with up to five SIM profiles on the card. akorIoT SIM ensures that you will never pay unnecessary roaming fees again. Moreover, it enables you to change the SIM card provider over the air in the field. The ARM Cortex Mx kits are usually enabled for ARM® mbed, allowing for development in a cloud-based environment, or in a locally supported environment through JTAG connection. Based on our open philosophy you can easily migrate code developed with the cloud based mbed C compiler to the Coocox compiler on Eclipse or any other C compiler you prefer.